It was dumping snow all day yesterday! Just what we’ve been waiting for the last few weeks up here in Park City. I was pretty jealous of the picture Alta ski area posted on their Instagram of the 22″ of fresh powder they got over the last 24hours. 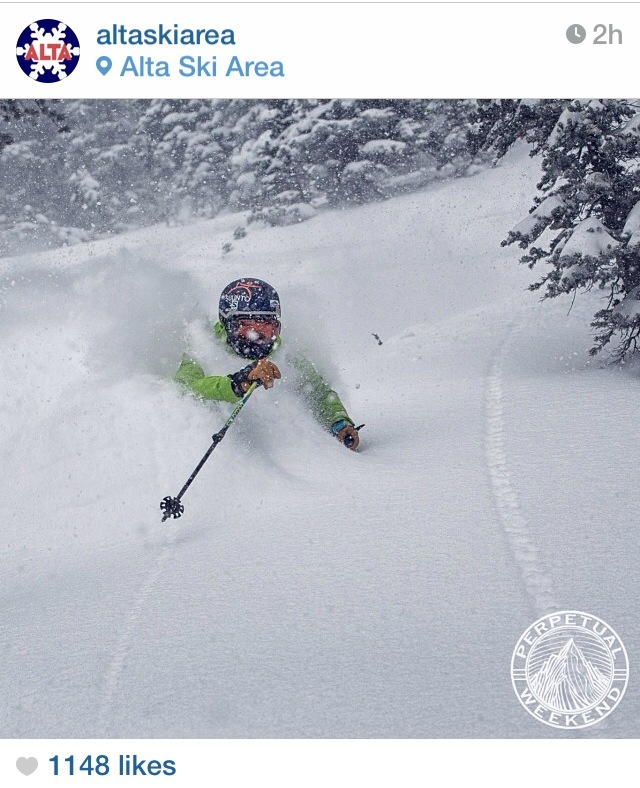 Untouched fresh powder… that guy is pretty stoked. I’m not going to lie I wish I was him! To ski all day this weekend (or whatever you’re going to be doing!) 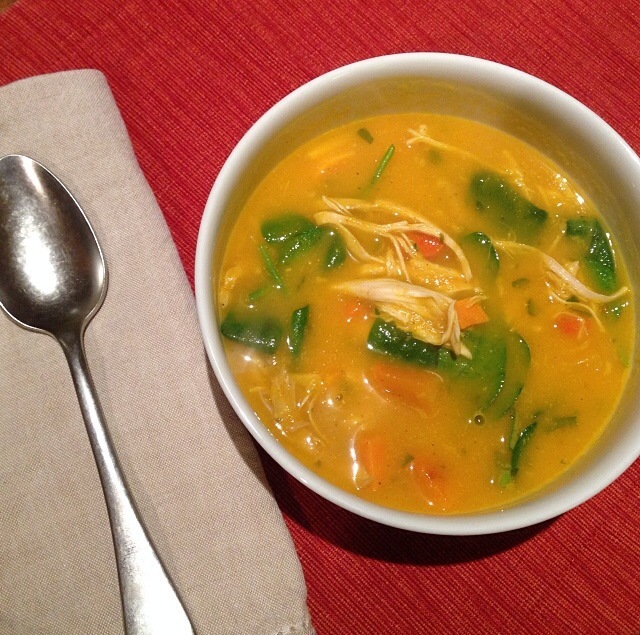 you’re going to need your strength and energy- what better way to get it than with a bowl of hot soup. Especially if you are back East enduring the “Polar Vortex”, you’ll warm right up with a bowl of this stuff! Plus this roasted vegetable and chicken soup is so easy to make and its super delicious- it’s ready in only 35-40 minutes! By pureeing some of the roasted sweet potato, butternut squash and carrot, the soup has a thick and creamy base without the use of cream or milk! The shredded chicken and spinach make it substantial enough to be a whole meal and fill you up, with out slowing you down! Gluten free, dairy free, and Paleo friendly this is the perfect dish for anyone with food allergies but its even more perfect for dinner this weekend because it’s packed with flavor, vegetables and SO GOOD! Enjoy! Toss the chopped vegetables, onion and whole garlic in the olive oil and sprinkle with salt and pepper. Roast for 20-25 minutes, until the vegetables are tender, tossing occasionally. Meanwhile, bring the chicken stock to a simmer in a large stockpot. Add the chicken, herbs, and salt and pepper. Cover and cook while the vegetables are roasting, about 15 minutes. Add half the vegetables to the soup, and place the other half in a blender. Make sure to put all of the onions quarters and garlic into the blender. Puree the vegetables with the 1 cup of water. Add the vegetable puree and baby spinach to the soup. Simmer for 5-10 minutes, until the spinach is wilted and the soup is hot. Adjust seasonings to your taste. This entry was posted in Recipes, Soup and tagged chicken, creamy roasted vegetable and chicken soup, roasted vegetables, vegetable and chicken soup, winter soup by skibootsinthekitchen. Bookmark the permalink. This is probably one of my favorite soups. When I make it, I can’t stop eating it. For a Hardy lunch (ha ha)or light super I highly recommend it!